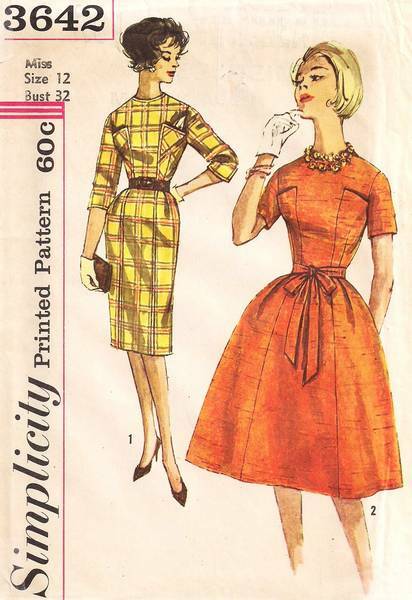 Vintage Simplicity sewing pattern 3642 for dress with slim skirt with back kick pleat or flared skirt. Both versions have side-front and front sections. The upper edge of each bodice side- front section has concealed pocket. 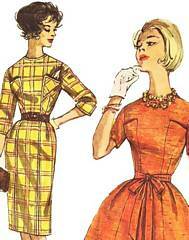 Short or 3/4 length sleeves. Left side zipper. Size 12; Bust 32, Waist 25, Hip 34. Envelope is moderately color aged and has new tape repairs/reinforcements on edges. Pattern pieces and instructions are in excellent condition.